They're blue and yellow, red and green, orange and black and purple and turquoise, sometimes alla t the same time. 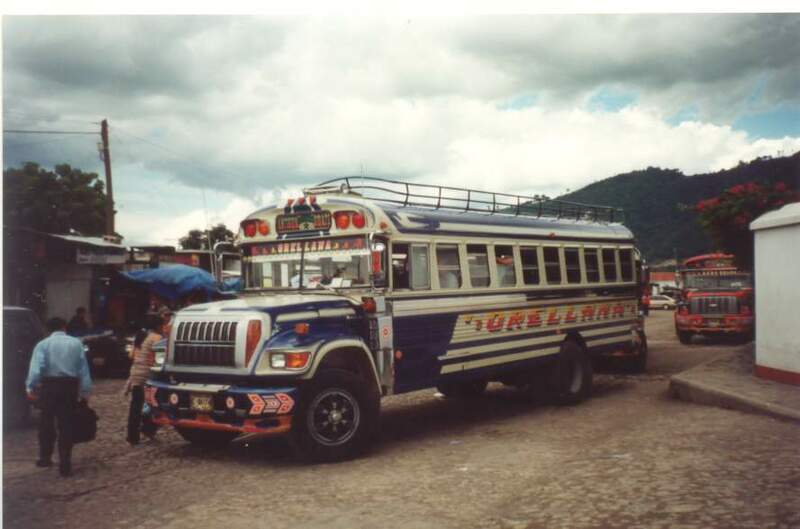 These colorful camionetas, often referred to as 'chicken buses', are the hallmark of public transportation in Guatemala. Brightly colored toy versions heaped with baskets of fruits and vegetables, and chickens, are available in all sizes in souvenir stores. Locals ride the buses with their goods to sell in markets and return home with the empty baskets to be filled again for the next trip. Others ride to work in business suits, students ride with clumsy backpacks and happy families ride on weekends to visit relatives. Once can travel virtually anywhere in the country on a chicken bus. It will take longer than in a car but, hey, where else can you get so much local color? Often their seats are torn and their windows cracked. Crucifixes, plastic flores, and faded fringe hang above the windshield, which may be adorned with decals of silhouetted pin-up girls and Tweety Bird. Stuffed versions of Winnie the Pooh, Bugs Bunny or Barney may also bounce along from hooks, while music blares from the speakers. 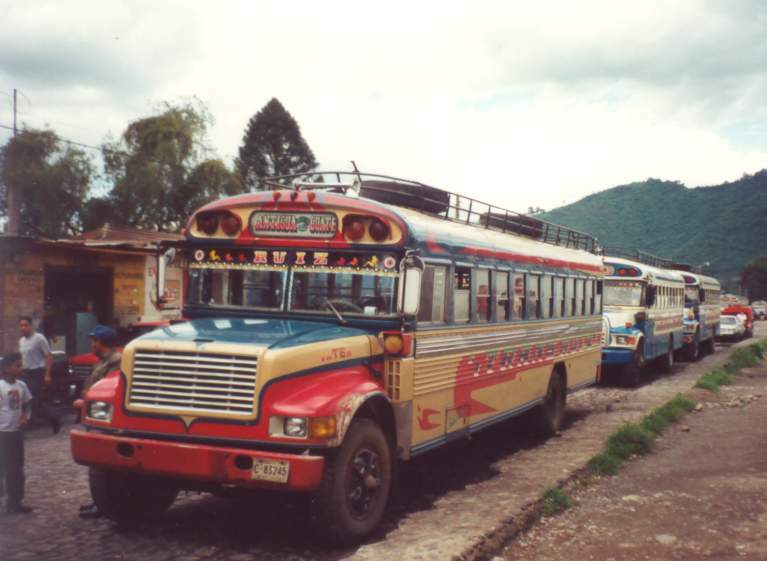 The outsides of the privately owned buses proudly bear their names: Norma, Elena, esmeralda, Dorita. Posted signs, in English, warn passengers not to talk with the driver while the bus is in motion and that the bus will not go if anyone is standing in front of the white line, long since worn off. Another vows commitment to children's safety. Yet others, in Spanish, assure riders that God accompanies them and guides the driver. It's a good thing too. They lurch along and belch black smoke. A window sticker documents a 1985 inspection in Missouri. A driver may pull over, grab pliers or a wrench from his toolbox, jump out, fiddle inder the hood for a minute, hop back on and the bus is off. Each bus driver has an assistant, the ayudante, who stands on the step at the open door, where he can easily hop out to help load or unload people or cargo or pop into the intersection to check for cros traffic. 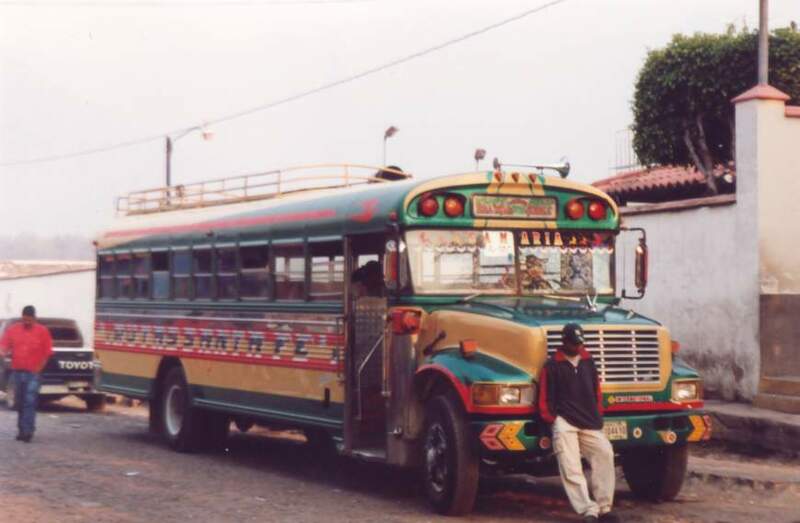 He also calls out the bus'destination to attract riders, who come running, and assures there is space, even though it defies the gringo eye to see where. Passangers eaferly board an already crowded bus. Standard configuration is three to each two-seater, plus children, and the objective seems to be to stay as far forward as possible. New boarders take the third place (usually half a seat) in the first rows, creting a bottleneck at the front of the bus for later boarders to push through, obeying the ayudante's urgings to move back. Once the bus is well on its way, past busy boarding zones, the ayudante squeezes his way through to collect fares. If he doesn't have correct change, he says he'll bring it later, and he does. The recycled U.S. school buses fit for children give little legroom for adults, and aisles can be as narrow as 8 inches. A ride in a chicken bus is a study in perpetual motion, a changing kaleidoscope. Each time a seated passanger gets off, the seat is taken by a standing passenger or one seated behind or across the aisle who seizes an opportunity for more space or a seat farther forward, and the whole arrangement shifts. 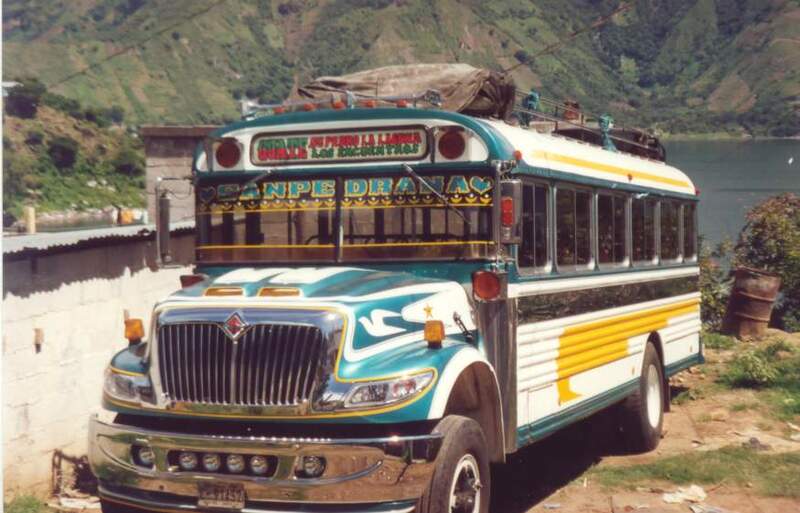 A trip to the city or across country on a chicken bus could be a little much for the novice, but a pleasant, quiet chicken bus experience can be had within Antigua. 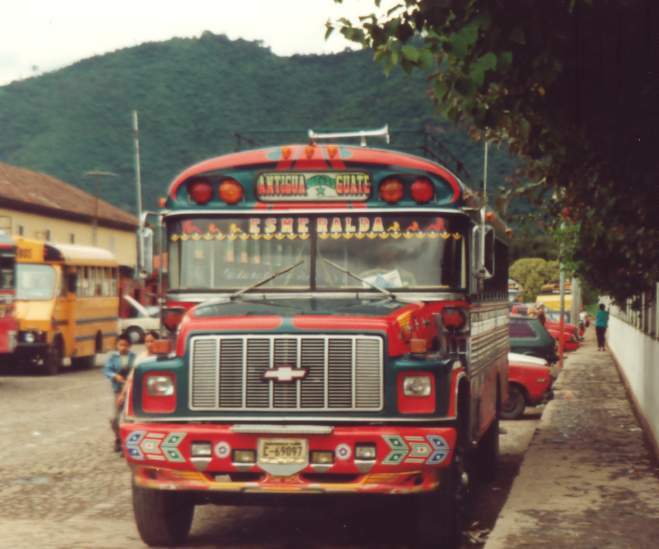 A suggestion is to board a bus that lumbers along 7th Calle destined for calvario, Inval or San Juan del Obispo. Schedule the trip during an off time when students are not going to or from school or women heading home from the market. Good times could be mid-morning or mid-afternoon. On boarding, smile and greet everyone with 'buenos dias' or 'buenas tarde.' The bet is you'll get friendly responses. 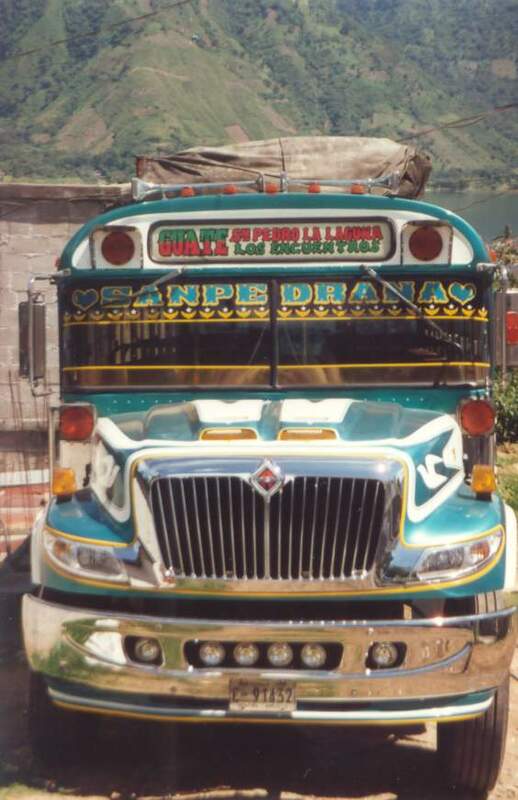 Thank the driver and ayudante when you get off and they're likely to wish you well with 'Que le vaya bien.' All that for 75 centavos. Enjoy the ride!